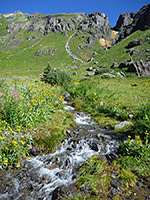 The Ice Lake Trail takes hikers into one of the most spectacular areas of the San Juan Mountains after a steep but relatively short journey of 3 miles, gaining 2,600 feet. 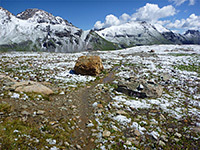 Most of the path is above the treeline, climbing through a two-level basin to a tundra plateau close to the mountain crest, surrounded by jagged, colorful peaks and ridges typical of this mineralized area of the range, but the prettiest components of the landscape are three lakes, Fuller, Island and Ice, each different in character and hue. Fuller is the highest and largest lake, fairly shallow and surrounded by rocky flats which rise moderately steeply to the summits of Golden Horn and Fuller Peak. Island Lake, which does indeed contain an island, sits in a rather more enclosed basin beneath Ulysses S Grant Peak and is filled by striking green-blue water, blending well with the greenish, grass-covered hillsides all around. The most beautiful of the three is Ice Lake, containing amazingly rich turquoise water, ringed by stark slopes and rocky outcrops. 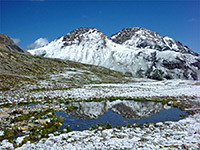 Like Island, Ice is fed by high elevation snowmelt, and both are somewhat cloudy due to a suspension of finely ground rocks, although there are no glaciers nearby. For all the lakes, the green or blue waters make a striking contrast with the grey-red rocks of the enclosing peaks, and the pure white of residual snow. Besides the immediate surroundings, the trail also gives good views back down the approach valley (Mineral Creek) to the higher peaks of the eastern San Juans. There are many streams and marshy areas along the way so the hike is good for summer wildflowers, with many dozen species found here. The elevation gain, although high overall, is split into different sections so the hike is not particularly difficult, and certainly not monotonous like some mountain climbs. San Juan Mountains area map, Ice Lake Basin topographic map. 50 views along the Ice Lake Trail; gallery, slideshow. Also a short video of Ice Lake. 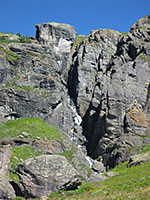 The Ice Lake Trail is able to reach the Alpine country near the mountain crest in a relatively short distance because the trailhead is already quite high (9,830 feet), located near the end of one of the few side roads off scenic highway US 550, the main route through the San Juan Range. This road forks off to the west 2 miles north of Silverton - a gravel track, fine for all vehicles, that leads up the U-shaped valley of the South Fork of Mineral Creek, past several popular campsites, suitable for RVs as well as tents. The trailhead is on the north side of the road after 4.4 miles, just before the main campground. There is no map or information board, just a sign bearing the trail name. Steep wooded slopes rise above the trailhead, with reddish rocky outcrops visible higher up. The path first crosses a short grassy area and enters the forest briefly, before switchbacking up more open land where the mountains ahead first come properly into view. 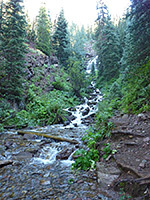 A stream comes close to the left then the trail crosses a tributary (Clear Creek) and climbs alongside for a short distance to the base of a cascade, before moving away to the west, past the ruins of an old wooden cabin. The route is straight for while, over a second creek and another patch of woodland, and out to a wider treeless area centred on a third small drainage. The greyish-red cliffs are quite close now, above steep slopes covered by lush grass and many flowers of different colors. The forest reappears on the far side of the open area, and several more steep switchbacks take the path another 700 feet up, until the gradient lessens abruptly at the rim of Lower Ice Lake Basin, where just a few trees remain; the scenery is mostly just grass and rocks, plus a small, shallow, unnamed lake a little way off-trail to the south. The basin is a popular primitive camping location. Cliffs encircle the basin on three sides, and streams flow down from the higher regions above, each lined by many more flowers. The trail continues up the basin, over several creeks, through a patch of California corn lilies, then diagonally up the cliffs on the west side, to a small intermediate bowl where a little stream flows down the path for a short distance. This is about halfway along the last major climb - the final part is due north, over bushier slopes and out to the short grass plateau surrounding Ice Lake, where the shoreline is reached by a short walk off trail. The lake looks deep, its sides sloping sharply downwards, without any underwater debris or vegetation, and is filled with brilliant aquamarine water, fed by two streams to the west and south. 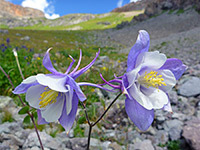 The far side is bordered by a low bench, above which is the highest section of Ice Lake Basin, while steeper slopes rise 1,100 feet to the north, to the mountain crest. From Ice Lake the path curves south, over a little ridge to a lesser pool filled with similarly colored water, sustained by a rock-lined stream. The route proceeds up the hill on the far side, steepish for a while then nearly level, and reaches the edge of Fuller Lake after 0.9 miles. 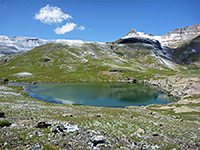 This lake is about four fifths enclosed by grassy or rocky slopes topped by several summits including Golden Horn, Fuller Peak and Vermilion Peak. One incidental point of interest is the ruin of an old wooden mining cabin, now used as a hiker shelter. An alternative way back to Ice Lake involves walking off trail and traversing the hillside to the north, round a protruding ridge, over a rocky gully and down a little to a flat area holding a few shallow ponds. A stream flows from here, down a short, narrow, enclosed section over the cliffs to Ice Lake, 200 feet below. 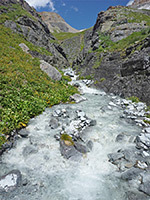 The water in the stream is also distinctive, grey-white in color, and cloudy, due to the suspended particles. One of the best scenes in the basin is the view down the stream, across Ice Lake towards Mineral Creek Valley. Once down the temporarily steep ground above the lake, the off-trail walk is completed by following the north shore, back to the official path. The biggest lake of the upper basin is reached by a 0.6 mile side trail that forks north just before Ice Lake, crossing a sloping hillside, round a rocky point then descending slightly to the shore. Island Lake sits in a small cirque directly beneath Ulysses S Grant Peak, and is made especially pretty by the small island right at the center. Most people turn around here, but a fainter trail does continue, climbing another 500 feet to the ridge extending east from the peak and down the far side into the upper end of Swamp Canyon, which leads to Ophir. Another good viewpoint hereabouts is just southeast of the lake, at the edge of the cliffs above the lower basin.